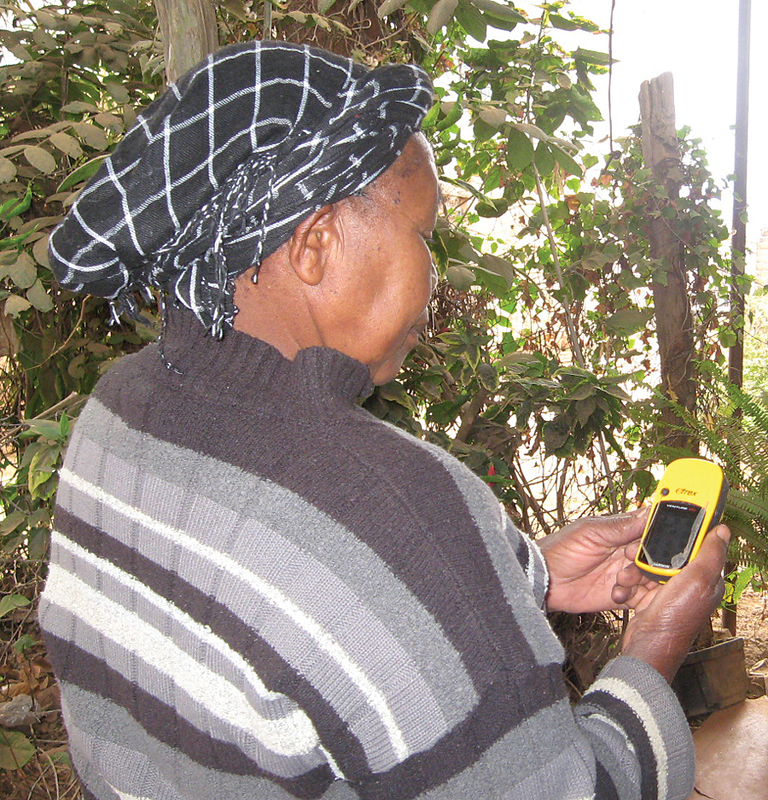 ArcGIS helps community-based organization support Kenyan women. GIS visualization and analysis support more targeted health services. Better reporting through maps gives sponsors information on how grant money was used. WISUVIE—which means take care of yourself in Kamba, one of the languages spoken in Kenya—is a community-based organization (CBO) located in rural Kenya that works with women living with or affected by HIV, orphans and other vulnerable children, and youth in Machakos County, Eastern South Province. According to the 2012 Kenya AIDS Indicator Survey Report, the HIV prevalence rate in the Eastern South Province is 3.9 percent, while the county’s prevalence rate stands at 5.1 percent. Using a handheld GPS, volunteers collected coordinates marking the location for each survey form that was filled out. WISUVIE was formed by a group of local women who wanted to support and help one another deal with issues posed by the disease, share personal experiences, and create preventive awareness among the general public. The organization is run and managed by volunteers who have diverse backgrounds: counselors, home-based caregivers, paralegals, nutritionists, community development workers, peer educators, and information systems specialists. WISUVIE was the recipient of a grant from the European Union through the United Nations Entity for Gender Equality and the Empowerment of Women (UN Women), Kenya Country Program, as part of the beneficiary organizations of the global program “Supporting Gender Equality in the Context of HIV and AIDS.” As part of the grant, staff members integrated GIS and GPS to monitor and evaluate the program. The objectives of the program that CBO implemented were to build the capacity of women living with HIV with skills to demand accountability for HIV prevention, care, support, and treatment services. CBO did this through training community mobilizers, as well as conducting a number of training of trainers sessions sessions to transfer the necessary knowledge and skills on HIV prevention and educate the new trainers on human rights, including how to advocate and lobby for those rights. [See “Building GIS Capacity Across the Globe: Train the Trainer” in this issue.] To manage the project and understand the impact, WISUVIE needed to find a technology that would assist with data analysis, visualization, and reporting. ArcGIS was chosen because it is used throughout the United Nations and by other agencies. WISUVIE licensed ArcGIS through Esri’s nonprofit program. The project ran for five months, from September 2012 to January 2013. Organization staff members integrated GPS and ArcGIS in monitoring and evaluation (M&E) activities to map venues in 19 administrative units where 33 direct beneficiaries had carried out community education/sensitization activities. By mapping this information, WISUVIE identified the best venues for reaching people and determined that 6,000 men and women were reached, of which 76 percent were women. Forty women and one man completed the ToT training and became part of the organization’s Women’s Rights Watch. Monitoring and evaluation of the program were carried out on 33 of the 41 trainees in the Women’s Rights Watch group. 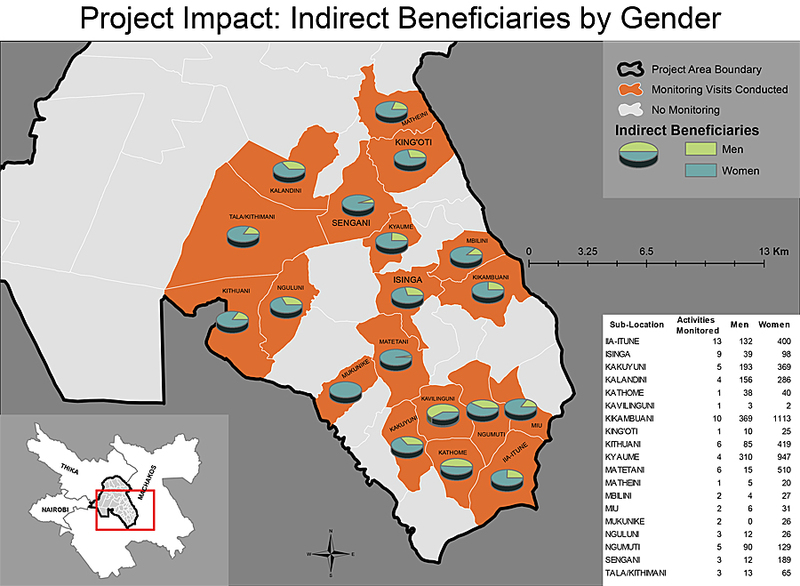 By showing information such as what types of surveys were held and where, grant money spending and impact were visualized. Prior to the start of M&E activities, the training beneficiaries were invited to a follow-up meeting led by WISUVIE CBO staff members who introduced them to the concepts of GIS. The members discussed the concept and value of understanding why the data was being collected. Then, the staff members asked to visit available beneficiaries; see where they had conducted training; collect GPS data; and, wherever possible, meet the community. During the M&E visits in the selected administrative areas, the M&E and GIS officers were accompanied by the project manager, a well-known and trusted community member. Since almost everyone has a mobile phone in Kenya, the team was able to call ahead and ensure that the direct beneficiary to be visited and other available community members would meet them at the churches, schools, homes, hospitals, and clinics where community education had been carried out. Using a handheld GPS, coordinates were collected for each paper form that the trainers had filled out during their training sessions in the community. Back at the WISUVIE CBO office, staff members used ArcGIS for Desktop to create a geodatabase of the GPS points from the field. The points were overlaid with additional data from the World Food Programme and the International Livestock Research Institute, two other organizations that also use the ArcGIS platform. Esri’s World Street Map was used as the basemap. The teams not only plotted collection points from the field surveys, they also added more attributes from the form so they could map them, as well. This allowed them to display the various attributes that were collected, as well as the many different venues they were collected from—including churches, barazas (public meetings), health facilities, and youth and women’s groups. WISUVIE CBO staff realized that although information about HIV and AIDS has been disseminated for decades and people seek treatment and, ways to protect themselves, some still feel stigmatized and don’t want others to know they are ill. Instead of seeking out treatment at the closest facility, these people travel to a distant facility. The effect of data sharing has had a great impact on the community. WISUVIE CBO staff has seen a huge domino effect through training—almost everyone is aware of HIV and AIDS. The most powerful impact has been the training to women so they understand that they have the right to stand up for themselves and their health. Two women who went through training were given medication that had been discontinued. The doctor was unaware and was still dispensing this medicine. The women insisted they didn’t want the drugs and demanded new medication. For more information, contact Ruth Nakitare, GIS consultant, and WISUVIE.